Here comes another book in the wonderful series of books "Nothric's Amazing Bible Stories for Kids". The 10 Commandments are the single most powerful set of tools for children and adults alike. 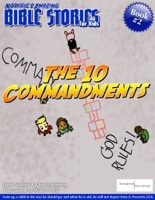 With each Commandment bringing a child's viewpoint (in their own words) to help clarify what exactly the Bible was stating, this is one book that is easily accessible for children of all ages. Easy to read and fun to look at, drop in on the Bible in a way that you've never seen before. This is a great addition to any series of Bible teachings you currently have for your children. Now come with us as we enjoy the wonderful world of "Nothric's Amazing Bible Stories for Kids : The 10 Commandments".